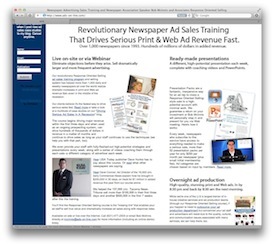 Driving Serious Newspaper Ad Sales: Here's to a successful 2013 with print, online display, and mobile! Here's to a successful 2013 with print, online display, and mobile! Thanks to everyone at the Post Register for a great few days last week working with your managers, ad reps, designers, and business community to kick off a year-long effort to drive major print and online (display and mobile) revenue for both the newspaper and the area merchants. The concept of making dramatic sales increases, not by locking unsuspecting prospects in a room and offering major discounts, but by doing the right thing and proving they'll get a response, was well-recieved by not only the newspaper's staff but the standing-room only crowd at the business community seminar. We're already hard at work providing solutions to the attendees in what's a truly win-win situation. Our goal is $600,000 to 1 million in added revenue, which should be a piece of cake after helping another client do $300,000 in just a week. Besides an even greater emphasis on digital display and mobile, we're adding an additional, very special piece this year which should make generating this kind of revenue a breeze: I'm going to personally help manage the staff, coach them, and hold them accountable throughout the year. As our "7 Essential Elements Every Ad Sales Training Initiative Needs to Drive Major Revenue in 2013" e-book explains, ensuring the day-to-day use of the new techniques is such a critical step to bringing in major revenue, we've decided to take over much of this responsibility given the mounting tasks and distractions ad managers and publishers everywhere are facing. It's going to be time-consuming for us but no doubt it'll increase the already strong results for our clients tenfold. As this happens, we'll eventually raise our rates, but for this quarter, we're won't be adding on any additional charge, making our sales program a steal for any newspaper looking to get the most bang for their training buck. If you're interested, there's still a space or two left. Just contact us and we'll share the details.